There’s no oscillator quite like your voice. And sometimes the simplest techniques can yield elaborate textures. Lesley Flanigan has built a body of work out of an elemental approach to electronics, and her new release Hedera is to me the most beautiful yet, transporting us somewhere truly sublime. The source, in addition to singing, includes feedback, a broken cassette player – but evolves into mists of sound and space, shifting from the delicate to the raw. I got to know Lesley some years ago in New York – she even came and once co-taught an electronics workshop on our event series, and played for us. And what always struck me about her practice was that it was improvisatory; whether it’s her voice or feedback or any other sonic material, it’s about focus on that element in the live context. That’s connected to me with the history of intra-disciplinary performance in New York’s so-called downtown scene, and the feeling of intimacy those performances could have. Her work with Tristan Perich (also her husband) makes them a rare aesthetic as well as personal match; Tristan’s 1-bit creations and so on have a similar dedication to raw minimalism. They also each have ties to the art world, not only the music world. Lesley is trained as a sculptor, which is a nice job description for her music and sound. Lesley Flanigan: Hedera (Trailer) from Physical Editions on Vimeo. While I haven’t released many recordings, I actually record myself quite often in the studio as part of my rehearsal/practice/experimentation/composing process. About 2 years ago, I was messing around with tape loops and cassette recorders, and recorded the clicking sound of a broken player. I found myself playing around with that sample and completely obsessing over its driving repetition, and the depth of sound I could carve out of it by layering it and adjusting the eq in real time. Pretty standard stuff. Both Tristan and I got super excited listening to my experimentations in a car on a road trip once, the bass shaking the rear of the car and vibrating the windows. Hah. Anyways, so I was really intrigued with the mechanical beat, and eventually decided I just had to do more with it. Jump ahead, I had my first child (#2 on the way! ), and was in a unique space of not performing for several months in a row. This time lent itself to me going into “studio” mode (sitting with my computer, mixer, loop pedal, mic and headphones) and I decided to work on this beat, and really explore the possibilities of my vocal techniques against the sound of the beat. So I laid the beat out for 20min – set it up so I could perform the frequency and beat shifts live, recording several passes. After I decided on the basic beat structure, I spent weeks recording vocals, and shaping a composition of ballooning, dense clouds of layered voice around the steady beat. I did this all live in numerous takes, using the same looping pedal system I’ve used with my feedback instruments (no computer looping). It’s just that with this process, the improvisations were given time and focus to develop to the point of becoming a real composition, and as such, I perform the same pitches and timings each time. So this is a piece, unlike my work with feedback instruments, that is repeatable. All that said, the process of creating the piece stems very much from my work with feedback. From building the textures of the beat (stemming from a mechanical analogue source) to using the same layering/building/sculpting approach with my voice interwoven within the raw sounds of beats. The second, shorter track is with speaker feedback. I included it on this album because it’s a rare recording of mine where I slightly adjusted with the lower pitches in the editing process (in other words -it’s a live recording that I later went back and manipulated, so it’s not a “pure” feedback recording like my other work). It’s actually a few years old, but I love it, and given the different direction of this Hedera track, I thought it was a nice way to finally put it out there. Sort of bridging the two worlds of my sound practice. Fittingly, the new record (out on Physical Editions) will premiere with a concert dedicated to placing the voice at the center of performance. 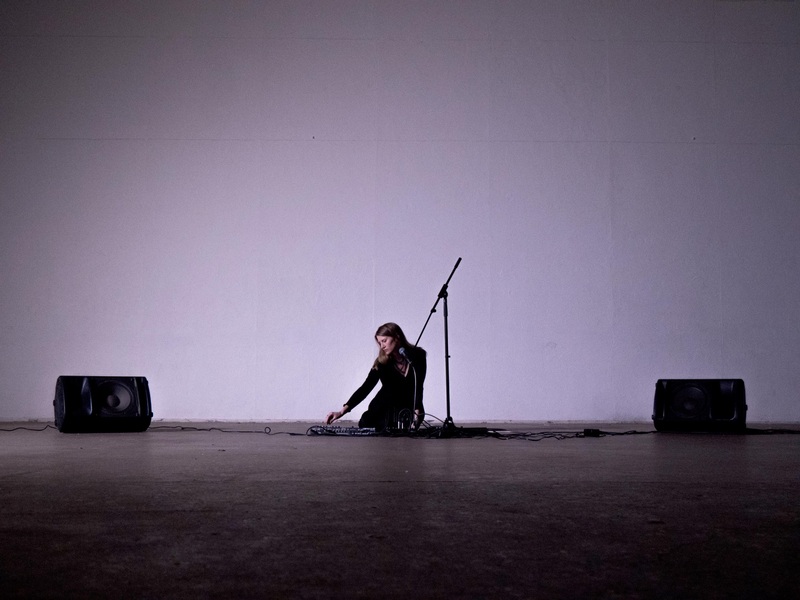 On 1st April, Lesley is alongside C Spencer Yeh presenting his solo voice work, a song single based on Hildegard von Bingen (by composer Nick Hallett and vocalist Daisy Press), and avant-garde turntablist/sound artist and New York mainstay Maria Chavez (working with recorded voice). This is, after all, New York – home to the likes of Meredith Monk and Laurie Anderson. That concert is at National Sawdust in Williamsburg, before Lesley continues on to tour the USA (NY, RI, Baltimore, Chicago). Bonus: Lesley at the Guggenheim. Lesley Flanigan at the Guggenheim from Lesley Flanigan on Vimeo.